Sink into the hot tub and tame your tensions. Take in the Stunning Mountain View from the Rocking Chairs. Hiking, rafting, tubing, museums, and waterfalls are all just minutes away. Cherokee Ridge Retreat is high on a mountainside but close to adventure. Minutes from tubing at the Oconaluftee River Island Park and white water rafting on the Tuckaseegee River, Touch the past and visit the Museum of the Cherokee Indian. Mingus Mill and the Mountain Farm Museum are about 15 minutes from the cabin. Both bedrooms are private, the upstairs bedroom has a King bed, the lower bedroom has a Queen bed. A full size bath is down the hall from the main floor bedroom. The upstairs bedroom has a sitting area. This two bedroom cabin is well-appointed with all the comforts of home and more. Cozy enough for a romantic getaway, this cabin is also spacious enough for a family adventure. The stone fireplace stretches up to the huge windows and vaulted ceiling in the living room. Watch your favorite movies on the satellite TV in the living room. Gather around the fire pit to roast hotdogs or fire up the gas grill and enjoy your cookout favorites. Rain or shine you can relax in the soothing sheltered hot tub in the gazebo. 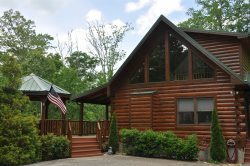 Cherokee Ridge Retreat is available year round and sleeps 4. For guest reviews, ckick the reviews tab. • Maximum capacity of up to 4 is based on county guidelines. Very close to the casino and a great place to hang out at. Cant come close to this amount of value from any hotel in the area. Great cabin with great views. We celebrated our Anniversary, went sight seeing and to the casino, My wife and I were running a bit behind in arriving at the cabin. About an hour after check in someone called us to make sure we made it and found the cabin without problems. This place had everything we were looking for. There is a great view, a nice hot tub and plenty of room in the house. We did not get to use the fire pit due to the rain but it seemed like a good place to relax it on drier days. The bed was probably the most comfortable I have slept on outside of my own. We were able to put our 7 month old daughter in her pack and play in the downstairs bedroom and enjoy our time after she went to sleep. There was also plenty of room in the living room for her to crawl around during the day. We hope to come back in the future and stay even longer. Cabin was clean, well appointed and very comfortable. The ladies at GSCR were very helpful and polite. We loved the cabin (perfect). Many more memories to make. Wish we had one more day! My trip to the cabin was very last-minute and I called the Wednesday before Labor Day Weekend... the staff was responsive, hands-on, and extremely accommodating of my hectic schedule. They got me a property that was more than I could have asked for and at a better price than I expected to pay. All throughout my stay they, even over the holiday, they continued to be accommodating! I've stayed with a different agency for my previous visits to Bryson City... and I will be staying with GSCR moving forward! This was a 40th Birthday surprise for my wife. We loved the location and had a great time! We will be back! The cabin was perfect. We enjoyed our stay. We will definitely be back! The cabin was very nice, very clean and well equipped. Pur favorite part was the hot tub! The people at GSCR are very friendly, helpful and professional. We have already booked it again for October's leaf season! The cabin is very well maintained with many nice amenities,cozy and neat. The location is excellent. We enjoyed just relaxing and listening to the birds chirping. What a wonderful view! We enjoyed the overall cabin and its atmosphere. Will come again! Amazing cabin. Accommodations were exceptional. So clean and beautiful. We liked the hot tub and cozy layout. We went horseback riding, hiking ans sightseeing. The staff at the cabin company is very friendly. Great staff ! Friendly and helpful, Cabin was nice and close to the casino. This was our second stay with GSCR and we enjoyed both cabins! It was the perfect Thanksgiving get away and we also celebrated my parents 42nd wedding anniversary. Hoping to make this a yearly tradition. We came to celebrate our 1 year Anniversary. The cabin exceeded our expectations and the hot tub was great! Working with your team was a breeze! I made a call to see if there was a cabin near Harrah's since I wasn't familiar with the area and the lady was so helpful! She was even able to tell that we had stayed with GSCR in the past and gave us a discount for being a repeat guest! Beautiful place - beautiful view. The cabin was beautiful and very comfortable. Enjoyed our stay so much. We loved the locations and the view. The cabin was very neat and serene for our family get together. We highly recommend the cabin and the company.